There are many reasons a woman may want to purposefully delay her cycle including avoidance of a heavy painful bleed during an event such as a holiday, wedding or sports tournament. My reason is to sync with the moon cycles (See this article to find out why). But how would I do this? And as a women’s health coach, yogini and scientist, what options would be the least disruptive to my body-mind-emotional health, plus be evidence based? Progesterone is the hormone that kicks in just after ovulation (around day 14, the release of a ripe egg from the fallopian tubes). Its job it’s to maintain the thickened uterine (womb) lining, in case of the egg getting fertilised (pregnancy). A fertilised egg will embed and grow in the lining. If the egg is not fertilised then progesterone levels drop from day 21 onwards, and the uterine lining falls away at around day 28. Appearing as your period. If you do happen to get pregnant then the placenta itself produces the progesterone to keep maintaining the uterine lining. 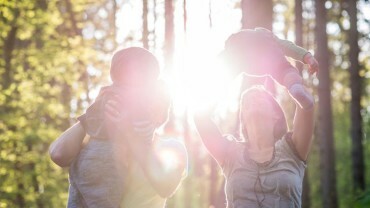 Keeping progesterone levels raised past day 21 is the key to delaying menstruation. sub-fertility, infertility or first trimester miscarriage. How can I stop progesterone levels falling if I am not pregnant? I first turned to Sisters Dawn and Alyssa, pagans who own The Apocathery in New Zealand. These ladies promote an honouring of all the elements of earth’s nature that we are a part of. An infinite source of womanly, earthly and cyclical information and celebration, I was off to a good start. They suggested I literally ask my body to delay the period. Being hyper-aware of mind-body connection, I did so. My period was 6 days late! In the name of science I must also reveal that I was moving house and it could have been due to stress. If I was not so keen to experience the deepest aspects of bleeding with a new moon, I would have had patience to continue for several more months. CONS: requires some months to evaluate full effect. How to make this work for you: Allow 3 months or more to align. Have a regular circadian rhythm (sleep-wake times). Bathe in the full moon light (camp outside for a few nights if you can). Regular meditation practice to enhance ability to hear your body’s natural wisdom and request its support and teachings. Recommended. After some light web-research, I asked my regular medical doctor for help in delaying my period. I was prescribed Norethisterone 5mg tablets. One to be taken three times a day. Start 3 days before your due period, and continue until 3 days before you want to start your next bleed (14 days for me). I must admit I was scared! It’s my life’s work to support women away from hormonal imbalances, with natural solutions, and here I was about to induce one in myself using synthetic hormones! I did not proceed any further. PROS: Evidence based. High confidence of success. Easy to obtain. Economical ($5NZD subsidised + GP appointment $30.00). CONS: Synthetic hormone causing side effects such as mood swings, weight gain, breast tenderness, heavy painful periods and subsequent irregular cycles. How to make this work for you: If this is your truly your only option (you have exhausted all others), be fully prepared for the side effects. Do not arrange social or challenging tasks during this time. Make friends and family aware of what you are doing and the possible side effects. Not recommended. I went to see an Integrated Medicine Practitioner at a female medical centre. This is a classically trained medical doctor who blends evidence based alternative and complimentary therapies, with the standard western medical model. This doctor prescribed Progesterone capsules, 200mg. One to be taken at night from day 21 of cycle, until 3 days before you want your period to start (19 days for me). The prescription was sent by the doctor to a compounding pharmacy. They called me when it was ready, for payment and delivery instructions. I received the prescription 4 days after the appointment. Just in time, on day 21 of my cycle! This is the method I have chosen. PROS: Evidence based. High confidence of success. Once daily administration. Side effects could include that of natural progesterone…drowsiness and contentment!! CONS: May not be economical for everyone $103.00 ($28.00 NZD for capsules and delivery, $75.00NZD for 30 minute doctor appt). How to make this work for you: Seek out an integrated medical practitioner (sometimes called functional). By nature they are open minded. If yours is not, then find another. Use capsules for correct dose (not creams you won’t know how much you’re applying). Take it at night in case of drowsiness. Seek prescription well in advance of day 21 so they can get to you in time. Recommended. 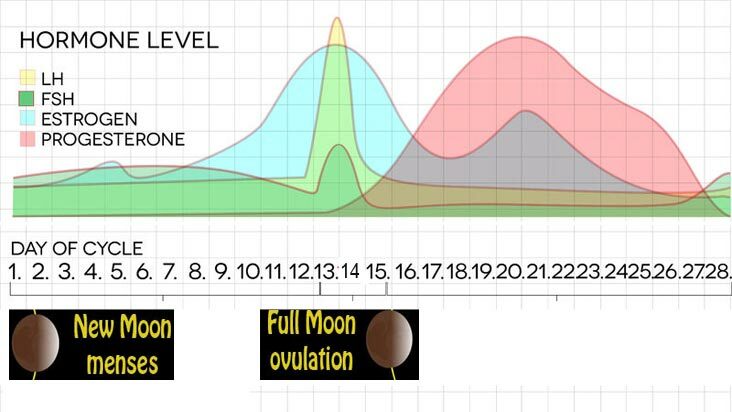 In the lead up to the new moon menstruation, would I be prone to more PMS symptoms? Would the uterine lining be thicker than normal and bring a heavier, painful bleed? As this is a bio-identical progesterone, ‘natures Valium, and most PMS is actually caused by LOW progesterone, I’m not too concerned. Dont miss the following articles where ill reveal whether it was the biggest mistake of my life, or an easy road to lunar-cycle syncing. PLUS if you want to follow pathway 1, i’ll share even more tips that I’ve received from wise women who are well versed in this topic. In the meantime, I’d love to hear from you about your thoughts and experiences on this topic. Please note I am not taking any other prescribed medications, have a regular painless menstrual cycle, a committed yoga asana pranayama and meditation practice. Do not try anything like this without proper medical guidance. Vitex 500-1000mg (Chasteberry) to reduce PMS symptoms and reduce infertility. 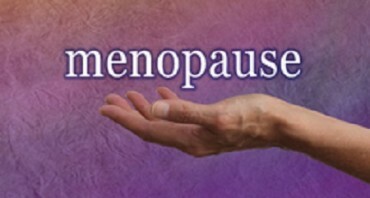 Vitamin C 650mg to increase progesterone levels.